Today, we have been given a challenge for writing by our teacher Mrs Anderson. 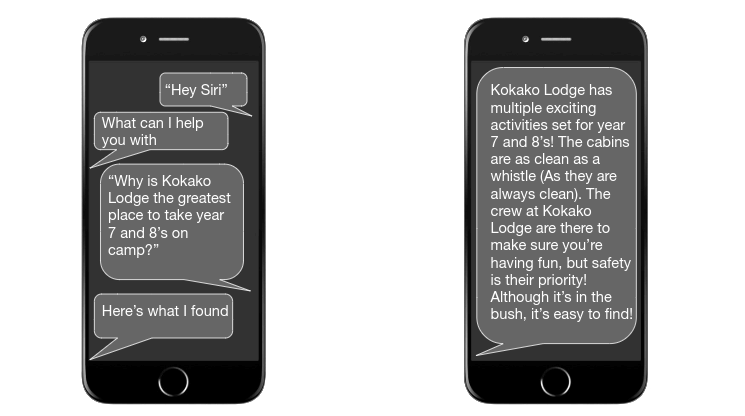 Our challenge was to write in exactly 50 words, a response that Siri (An automated program on Apple devices) would give us if we asked it "Why Kokako Lodge is the greatest place to take year 7 and 8's on camp?" Although Mrs Anderson wanted to make this more of a challenge. So what we could do is gain points by using different Language features that would give us 5 points each. If every feature was used, then you could gain a total of 40 points. Although for another 5 points, you needed to make sure that everyone in your group was working together, and that a learning conversation was taking place. If you had exactly 50 words, and you used different references, you could even have 100 points total! Once you finished writing, you needed to digitally create a Siri conversation showing Siri's answer. The final step was to create a Screencastify that had us voicing over the whole conversation. For this activity, I worked with Julian, Alex, and Viliami. We had a lot of fun, and enjoyed recording the most.